With the votes still being tallied in some states, results indicate that the Senate has become more strongly Republican, while the House has been taken by the Democratic Party. Democratic Sen. Bob Casey and Pennsylvania Gov. Tom Wolf were re-elected, while both houses of the General Assembly remain majority Republican despite Democratic gains. Although most midterm elections see losses for the U.S president’s party, with around 113 million votes cast — 47 percent of eligible voters — this is the highest turnout in a midterm election since 1966, and a reversal of 2014’s low 37 percent. The incomplete count from the City Commissioners puts Philadelphia turnout at about 51 percent. 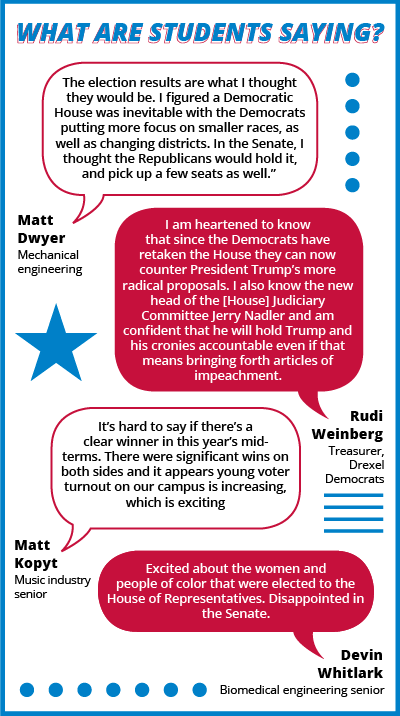 Around Drexel, voters re-elected Democratic incumbents like Rep. Dwight Evans, State Sens. Vincent Hughes and Anthony Williams, and State Reps. Vanessa Brown (who was recently convicted of taking bribes) Donna Bullock and James Roebuck. At the national level there were several firsts for women. Democrats Sharice Davids (Kansas) and Debra Haaland (New Mexico) will soon become the first Native American women to serve in Congress. Democrats Rashida Tlaib (Michigan) and Ilhan Omar (Minnesota) will be the first Muslim women in Congress. At the age of 29, Democrat Alexandria Ocasio-Cortez (New York) will be the youngest woman elected to Congress. Meanwhile, in Colorado, Democrat Jared Polis is set to be the first openly gay governor of any state. One first that hits close to home is the election of adjunct assistant professor at Drexel University (and mayor of Swarthmore) Tim Kearney to the Pennsylvania State Senate in the 26th district. He will be the first Democrat to hold that seat. Ballot measures in several states also made major impacts. Michigan legalized recreational marijuana over the age of 21, while Utah and Missouri legalized it medicinally. Florida restored the voting rights of 1.5 million felons who have finished their sentences. Massachusetts passed a referendum to expand transgender rights protections. Alabama and West Virginia amended their state constitutions to block public funding for abortions (Oregon rejected a similar proposal). Results are still outstanding in two major races. The governor’s race in Georgia is ongoing, with Democrat Stacey Abrams refusing to concede until all votes are counted. If the already razor-thin margin gets much narrower, an automatic runoff election will be triggered for December. Florida meanwhile is recounting the votes in its senatorial election, where Republican challenger Rick Scott has, it appears for the moment, won.